“This Is Not a Film,” a documentary by co-directors Jafar Panahi and Mojtaba Mirtahmasb, opens with a man seated at his breakfast table, preparing to eat. He takes a phone call, puts it on speaker phone, and seems to tense up in his shoulders, bending slightly to avoid looking directly at the camera. 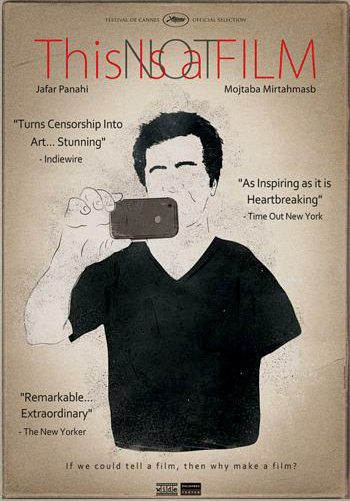 As the conversation continues, we learn that the man is celebrated Iranian director Jafar Panahi. His seemingly innocuous breakfast routine conceals a precarious personal situation. “This Is Not a Film” makes for an interesting viewing experience, but unlike many films, it requires an understanding of events not shown on screen to arrive at a full appreciation of what is on screen. Panahi has been at odds with the Iranian government since 2000, when he completed “The Circle,” a film critical of Iran’s Islamist policies and its treatment of women. In July 2009, he was one of several protestors arrested at the grave of Nedā Āghā-Soltān, a woman shot and killed during a protest of the 2009 Iranian elections. Arrested again in 2010 for “making a film against the regime,” Panahi spent time in Iran’s Evin Prison. Film directors and actors from all over the world, including Ang Lee, Paul Schrader, Steven Spielberg, and Francis Ford Coppola, signed a letter calling for his release. There was also a petition signed by 50 names in the Iranian film. As “This Is Not a Film” opens with Panahi free on bail, he still faces a six-year prison sentence and a 20-year ban from filmmaking. Unwilling to quit working, he decides to take a script and act out all of the parts himself. This allows his collaborator, Mirtahmasb, to film him. Panahi remains hopeful, as he explains to the camera, that the results will not count as a film according to the government. As Panahi begins to act out his script — a story of imprisonment and intolerance — it’s natural to wonder how much of the script is inspired by his own situation. The director explains in passing that he has enough ideas for three or four new films. The only major factor holding him back is the government, which must approve the scripts for each new film. This roundabout approach to cinema is not the only thing happening in “This Is Not a Film.” Mirtahmasb, a veteran documentary filmmaker who has also spent time in government prison, follows Panahi around conscientiously with the camera, even as they nervously joke about the possible complications and the nature of cinema. Gradually, we learn about Mirtahmasb’s own story, his own situation and beliefs, and how these beliefs converge and differ from Panahi’s. The finished results were smuggled outside Iran, in a flash drive concealed inside a cake. Panahi explains, referring to his previous movies, such as “The Mirror” and “Crimson Gold,” that he lets his actors, and sometimes even his settings, assume effective control over the filming, to capture sights and impressions that can’t be reached otherwise. He demonstrates this in past films, and also in the present one. Even with his freedom and his artistic liberty on the line, he’s not afraid to open his front door and cede control, and his camera, to whomever may be on the other side. He takes quietly awe-inspiring risks in the face of his own ruin. “This Is Not a Film” plays April 13 through April 19 at the Northwest Film Forum, 1515 12th Avenue on Seattle’s Capitol Hill. For showtimes, prices, and directions, call 206.829.7863 or visit www.nwfilmforum.org/live/page/calendar/2101.